The homestays are a very important aspect of the SIT program. I think the experience of living in a different culture almost requires this aspect. The families help us a lot with our Spanish language skills, as well as cultural behavior learning, information about Ecuadorian society, and, obviously, the quintessential family love and caring. I can go to my mamá when I have a headache, when I’m frustrated with my classes, even when I feel really confused about being here in Ecuador. More than just living with a family, we often have homework assignments that incorporate them. Sometimes it’s something as simple as talking with them about an Ecuadorian movie we’re watching or a news item we talked about in class. Later in the semester, we have to write a Personal-National History Essay about a historical event in Ecuador that also affected some family member of ours and how his/her personal account compared to the history books. These little assignments help us learn about the history and culture, as well as to form a closer relationship with our family members. Living in a homestay certainly has its difficulties as well. It sounds so silly, but after “moving out of the house” into university housing, I felt that I was in control of my life: how I spend my time, what and when I eat, when I sleep, when I get to simply have some alone time. This homestay is quite an adjustment. Now, I depend on my host mamá for my food, for clean clothes, and for help in absolutely every part of life. Mamá prepares and serves us all the food, sets and clears the table, washes the dishes, stores the food, and the kitchen is spotless again before I know it. Still not sure how she does that… I still don’t know how to boil some water for tea on the gas stove because she’s in the kitchen asking what I would like before I can even find the kettle! I have washed my own clothes for myself at home since I was about 14, when thought I was too grown-up to have my mom do my laundry (I don’t remember her objecting too much). I have no idea how to wash clothes here… and the machine is even in English! Apparently you have to hook up some hoses though, lesson learned. But my mamá simply insists upon doing it. I went to the pharmacy with my mamá the other day when we were running some errands and I remembered I ran out of band-aids. When I went to buy them, not only did I have to ask my mamá how to say band-aid, she had to explain to me that No, you don’t buy an entire box of band-aids, who would possibly need that many? About 10 minutes of explanation later, we left the pharmacy with 5 individual band-aids. Apart from Band-aid runs, we get to go out with our families and they show us around their city. 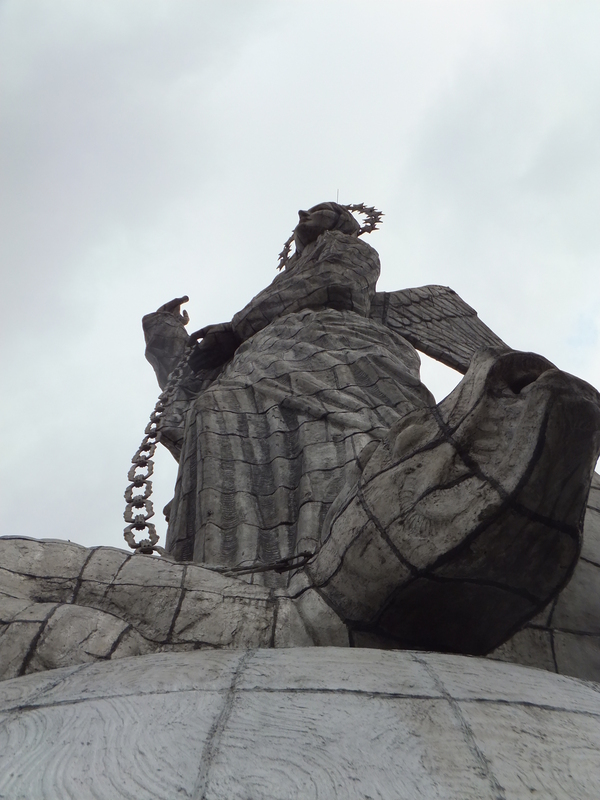 We went on Saturday afternoon to the Virgen de El Panecillo, a hill in the center of Quito where a priest built a large Virgin Mary back in 1976. 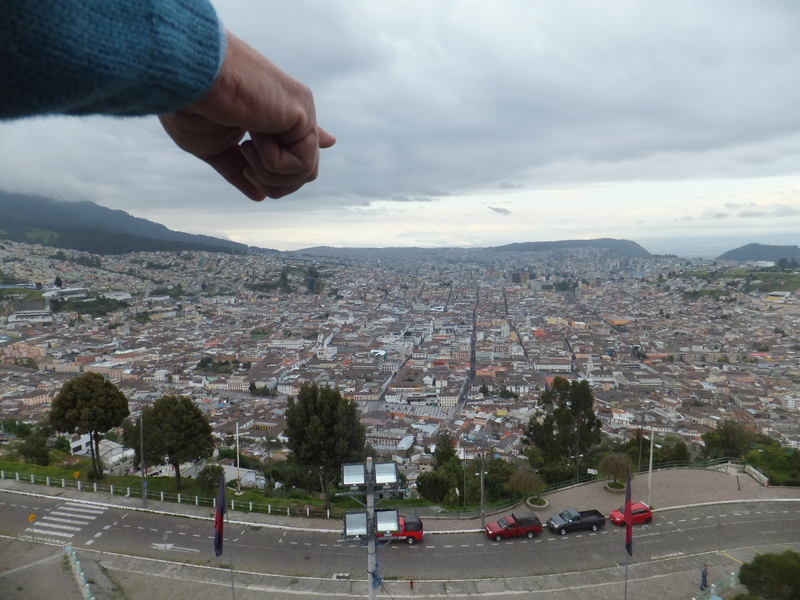 From that point, you can see all around the city of Quito, much like the panoramic view I got to see from the Volcanic mountain hike on my first day here [see Centers of the World (Posted by Blair in Ecuador)]. 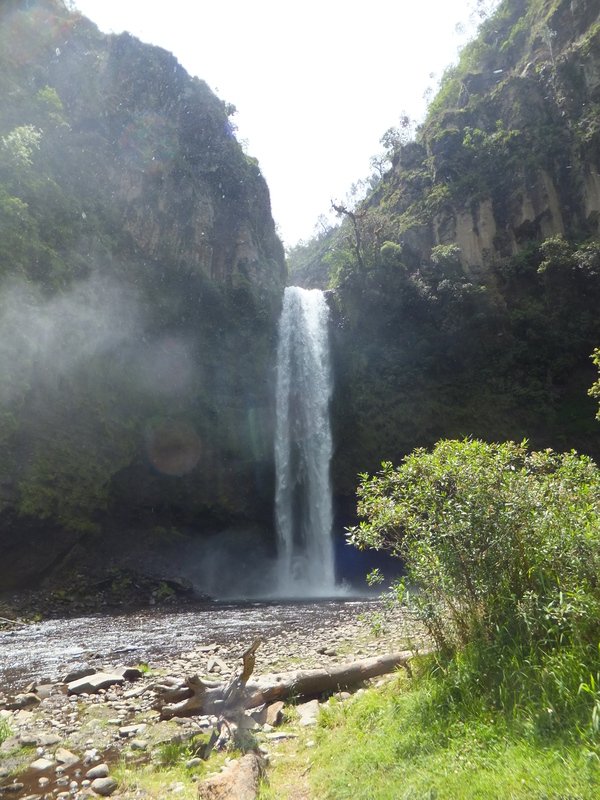 We also got to go to Molinuco Falls on Sunday, which is a HUGE waterfall at the end of a lovely hike. The walk there includes smaller waterfalls, some pools where you can swim, even a ‘Meditation Pond!’ For an idea of the size and force of this waterfall, you should know that I could feel the mist from where I was standing in the photo below! The option to live in a different culture, in a society different from mine, to share with the people of that society, and to live for some time in a different country is a rare opportunity. Not everyone can spend a year of their life hopping between countries due to their committments. I believe many people also prefer to stay in their safe and comfortable space. However, the information and the lessons that I will have learned by the end of the program, whether learned in the classroom, in the daily activities of my family, or during the excursions we take, will make this an unforgetable semester. P.S. My family prefers that I do not write about them personally in this blog. We will also be living with a family in a different section of Quito beginning in March and I hope to be able to talk a bit about them. This entry was posted on Friday, February 22nd, 2013 at 10:31 pm and is filed under Blair in Ecuador, Spring 2013. You can follow any responses to this entry through the RSS 2.0 feed. You can leave a response, or trackback from your own site.